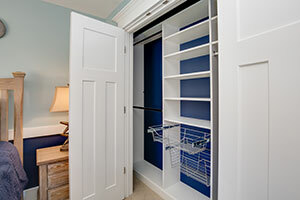 Reach-in closets, as opposed to walk-ins, are an architect’s favorite type of storage area frequently included in secondary, and kid bedrooms although they are also quite common in master bedroom suites as well. When adding a closet system to a reach-in, the sections should be designed around the closet door openings for accessibility and ease of use. Typical mirror or solid sliding doors keep one half of the space hidden while the door opening allows access to peruse clothing options for the day’s activities. 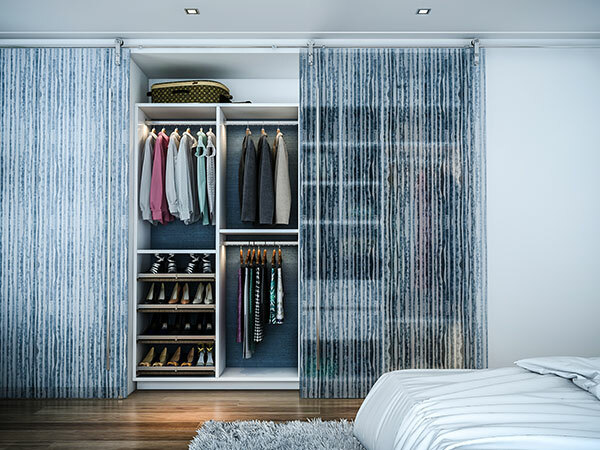 Adding a custom closet system is a must for reach-ins, also known as wall closets, if storage or even organization is a priority for the bedroom. These systems not only increase hanging space but offer the ability to reduce bedroom dressers by incorporating drawers, baskets, and pull-out trays. The system design is sectioned off to include rods for hanging clothing occupying much of the space, while shelving and drawers provide additional storage for items like undergarments, socks, and jewelry. When it comes to designing the ideal reach-in closet, the options are plentiful and designed around the unique needs of the user. For those that prefer a full opening so they can view the entire closet system while standing in front of the reach-in closet area – barn sliders or bi-fold doors are worth exploring. Return walls and headers are areas requiring design skill on how best to utilize these spaces, so they are as accessible as possible. During the design process for your reach-in closet, you’ll want to start with a plan that is two-fold and considers both storage items and space. A designer is well-equipped to help you begin this process as it can seem overwhelming at first. To start, you’ll want to assess the clothing items that you have at your disposal that you will want to store in your closet. Ask yourself what items your new system will house. Will your new space only provide storage for shirts and sweaters, or will it need capacity for tailored suits which require hanging lengths? 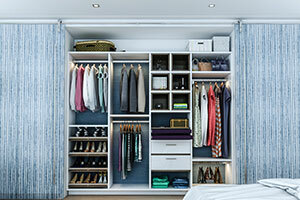 Reach-in closets are all about functionality, and maximizing space. Your designer will help you analyze the area you’re working with and help you tailor a well-thought-out plan based on a combination of their experience and the size of the wall closet. Whether a homeowner with only a small space or a more expansive one, you can still achieve the ideal design for your wardrobe. Your designer will help you with the modifications based on your storage needs and the space for your wall closet. Begin the design process with considerable attention to hanging space, and then moving on to shelving, ideally 12 and 16 inches deep to ensure that items are not lost in the depths of the closet. The key to a great design is ergonomics – the process of designing spaces so they fit the people using them. So instead of having to rummage around on the floor to find shoes, or endless bending down to place items on shelves at knee height, more ergonomic design will help store items so that they are easier to find and grab right away with little effort. The organization will, in turn, help keep the closet nice and tidy. A great reach-in design also includes functionality for a wide range of closet essentials, along with accessories. Racks for wardrobe accessories like belts, ties, and jewelry are also a big part of the equation. Smart spaces will include valets for pairing outfits, belt racks, tie storage, and even scarf racks. And shoes may be stacked on built-in shelves or even in lower level drawers for easy access. Just because the closet opts for functionality over excess, doesn’t mean that it can’t be embellished with stylish extras like moldings and LEd lights. Freshly painted walls and doors may also add extra flair to your space while adding mirrored doors offer dual functionality. 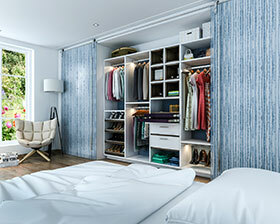 There are no limits to the creativity when designing the ideal bedroom closet. The closet of your dreams is literally within your reach. master bedroom reach-in is well organized by grouping like items together. 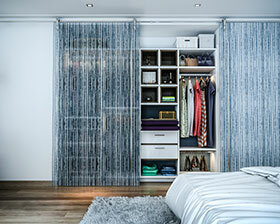 Modern style pressed glass barn doors allow the entire closet to be viewed all at once. Two-tone cubbies add a pop of color to the white melamine. Right side of the closet system has drawers and hanging. This is a large reach-in closet in the master bedroom with 4 sections. Top shelf is used for over-sized boxes and luggage storage. 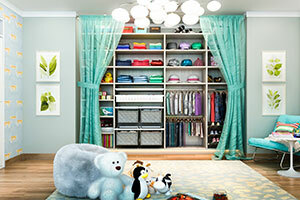 Visit the custom closets gallery and see more reach-in pictures. What is a Custom Reach-in Closet Design?